On her 2011 album, Voice, Hiromi sought to capture people's "inner voices" and strove to create what she called a "three-dimensional sound." For that album, the Japanese composer/pianist assembled a trio that included herself and two veteran players - contra-bass guitarist Anthony Jackson (Paul Simon, The O'Jays, Steely Dan, Chick Corea) and drummer Simon Phillips (Toto, The Who, Judas Priest, David Gilmour, Jack Bruce). While Hiromi had played with Jackson prior to recording Voice, she had never recorded an entire album with either him or Phillips. "I had such a great time recording with them, and we went on the road together and that was even more fun," she says. "As soon as we started playing live shows, we grew up as a band. It was the biggest fun I've ever had in my life musically. That's why I wanted to do another record. I couldn't let it go. I wanted to do it again." 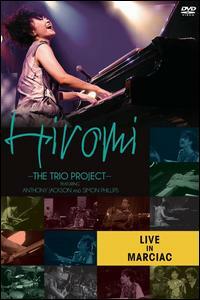 Next April, Hiromi will bring her "Trio Project" to the SF Jazz Center, and next week, her new album is set to be released. While on the road, Hiromi started writing music for a follow-up, Move, set for U.S. release on March 5, 2013 on Telarc, a division of Concord Music Group. (European release date is October 2, 2012.) "Because I had been playing with Anthony and Simon for quite a bit, I just started to understand their characteristics, and I could find a hidden gem in their playing," she explains. "As a composer, I really wanted to write the songs especially for them, and I wanted to extract the unique beauty of their playing." When it came time to go into the studio to record Move, the trio was able to record quickly and effortlessly since many of the songs had been road-tested. Recorded by GRAMMY®-winning producer and engineer Michael Bishop at Aire Born Studios in Zionsville, Indiana, Move, like Voice, has an overriding theme, which Hiromi describes as "time in one day." "You wake up and go to work and then hang out," she says. "The album is like a soundtrack for a day." The opening title-track begins with an undulating piano riff that mimics the sound of a ringing alarm. "It's one of the most difficult pieces I've ever written," says Hiromi. "I had great musicians with me, and we worked hard on that song. In the studios and rehearsals, we spent a lot of time to play it right. It's very tricky because when a song sounds difficult, it's not fun. It has to groove and it has to go beyond ‘this is a difficult song.' It has to make you groove and feel the rhythm. To reach that point really took some time." The groove deepens on "Endeavor," a tune that starts off with a funky guitar riff that gives way to beautiful piano solos before diving back into the funk. "It has a lot of tricks with rhythm so that when you're feeling the groove and shaking your head with the music, it slips backwards," explains Hiromi. "Then it slips back again. It has a lot of tricks rhythmically. I really like putting these small treasures in the songs because it's like treasure hunting." The album's centerpiece is a three-part suite divided into segments entitled "Reality," "Fantasy" and "In Between." "I really like writing suites," says Hiromi. "I've done it a couple of times in the past and it's good for the writer to come up with a big story. I always want to tell stories with my music. I always see visuals, and I always think about music like a select story. I have so much fun writing these songs that are about contrary things like your frustrations and also the fight in yourself. It took awhile to finish and there is a main theme in each song so by the third piece, if you listen to it carefully you will hear the main theme. I like that kind of musical trick." The album comes to a close with "11:49 PM," an 11-minute song designed to mark the end of one day and the beginning of a new one. "Before you go to bed, you think through what you have been through and you think and all these emotions come out," says Hiromi. "I think the nighttime is the most emotional time of the day, especially when you're at home. I don't know what makes people think that but it's just the night. People show so much more emotion and heart in that particular time of the day. I started to write a song about it. Whenever I wrote [‘11:49 PM'], it was always at nighttime. I went through all these emotions."